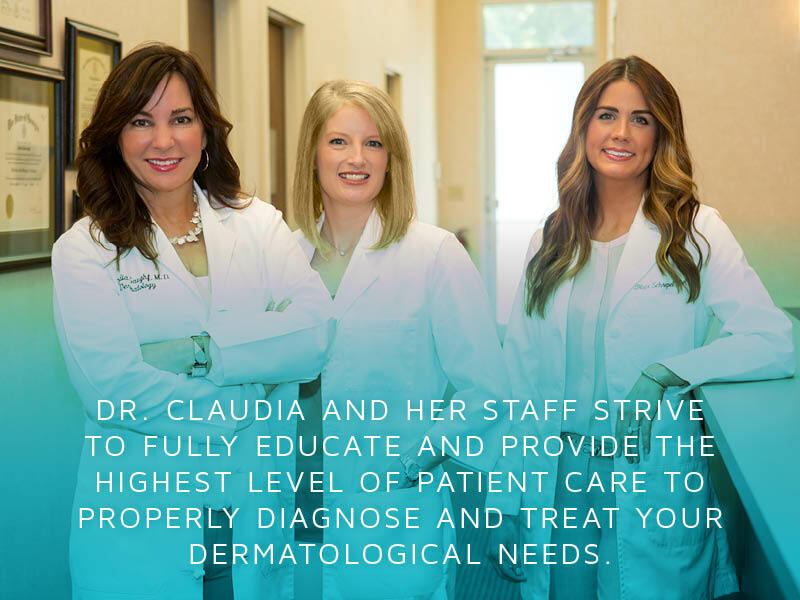 Dr. Claudia N. Gaughf is board certified by the American Board of Dermatology and has been in practice since 1997 and is a fellow of the American Academy of Dermatology and a diplomat of the American Board of Dermatology. Dr. Gaughf received her medical degree from the Medical College of Georgia on a full academic scholarship. She completed her dermatology residency at the Medical College of Georgia following two years of Internal Medicine training at the Medical Center of Central Georgia. Her undergraduate degree was obtained at Florida State University on a full tennis scholarship. Dr. Gaughf participates in the training and education of physician assistant students. Her specialties include prevention, early diagnosis and treatment of all types of skin cancers. Additional focuses include facial rejuvenation including novel skin care products. Dr. Gaughf was born in Macon, Georgia. Her personal interests include tennis, running, ballroom dancing, and family activities with her husband and two children. Amy Millsap is board-certified by the National Commission on Certification of Physician Assistants and licensed by the Georgia Medical Board. She is a graduate of South University in Savannah, GA with a Masters Degree in Physician Assistant Studies. She received her Bachelor of Science Degree in Biology, with a minor in chemistry from Appalachian State University in Boone, NC. She is a fellow member of the Society of Dermatology Physician Assistants, Georgia Dermatology Physician Assistants and the American Academy of Physician Assistants. She is originally from Murfreesboro, North Carolina. Amy spends her free time with her husband, son, and dachshund and she enjoys traveling, cooking, and gardening outdoors. Blair Schrepel is board-certified by the National Commission on Certification of Physician Assistants and licensed by the State of Georgia Medical Board. After receiving her Bachelor of Science degree in Biological Science from the University of Georgia in Athens, GA, she graduated from the Medical University of South Carolina in Charleston, SC with a Master of Science in Physician Assistant Studies. She is a fellow member of the Society of Dermatology Physician Assistants, Georgia Dermatology Physician Assistants and the American Academy of Physician Assistants. Blair was born in Hamilton, OH and grew up in Brooklet, GA. In her free time, she enjoys traveling and hiking with her husband, running, cooking and spending time with her chocolate lab. Deborah Bassett, our licensed aesthetician, has been with our practice since 2010. She moved to Savannah from New York where she worked for Coty Beauty and earned her Esthetic License and Makeup Artist Certification. Prior to relocating to Savannah in 2009, Debbie spent over 30 years in the Cosmetic and Skin Care industry working for Coty Beauty. There she held various positions which included training, product development, fragrance research and account sales. She is educated on medical skincare and works closely with Dr. Gaughf to provide clients with the best skincare products and practices suited to each client’s needs. Deborah was born in Rochester, New York. In her free time she enjoys yoga, meditation and volunteering for the Humane Society.